This functionality allows Document Owners to allocate work to Team members while restricting their access to the rest of the document. Note: This functionality will not restrict access to the Project if the user is not a Lite user, in order to completely restrict user access to the Project Document while providing Contributions they will need to be set as a Lite Bid user. 1) Open the Project Document (Proposal) of which you are the Owner. 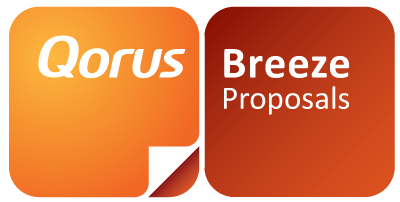 2) Click on the Qorus Breeze Add-in button (on the 'Home' ribbon of Microsoft Word), and login to the panel (if required). 3) Click on the Allocations button in the panel. (See Below). 4) Highlight the text or section you would like to Allocated and click Add Task. 5) Select a team member who is not an External team member (denoted by (Ext)) and check the Private Allocation check box. 6) This will display the Supporting Documents selection option which will display all Supporting Documents attached to the Project. Selecting 1 or more Supporting Documents will make the selected documents available to the designated External Team Member when they open the assigned External Allocation. Title: Will be the title of the Allocation Tasks. Due Date: When the Allocation task is due. Note: This date cannot be set for later than the projects due date. Include Reviewer: Should the allocation need to be reviewed, a Reviewer can be set, with a Review Due Date. Manual Preview: A preview of the allocation content will be created automatically. In order to manually set the preview, check this option. Depending on the options selected above, you may be presented with a preview of the Allocated content. To update the preview, select the appropriate text and click the Refresh button. Click Submit once done. Notice that the task has been added to the task list. 8) Once all the tasks have been created click on the Allocate button next to Add Task on the Breeze Panel. An email will be sent to the team member, advising them of the allocation. This email will contain a hyperlink to the Web Contributions interface which will allow the user to provide their Contribution and when ready mark the Contribution as Complete. For help on How to Install and log in to the Breeze Panel add-in for Word, follow the step-by-step instructions here. For help on Responding to a Private Allocation, please read the step-by-step instructions located here.